When it comes to art, Britain has not had much luck with its monarchs. Since Plantagenet times, the rulers who have ascended our throne have generally been cultural dumplings: dull in taste, stodgy in impact. Victoria was the worst, because she reigned for so long without achieving anything of artistic consequence. Of course, Henry VIII had a superb moment when he brought over Holbein from Switzerland, but most of that good was undone with the dissolution of the monasteries and the eradication of Britain’s rich Catholic past. 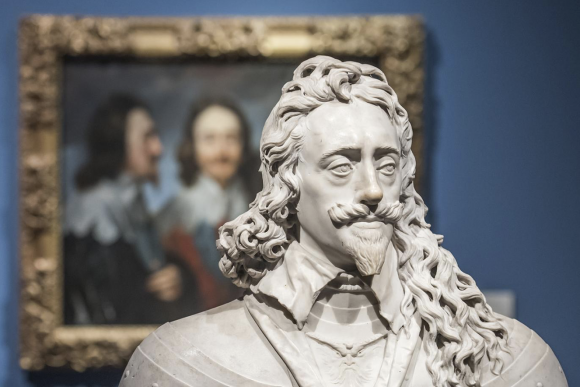 So it’s a grim artistic story — with one momentous exception: Charles I. Having Charles I in the list of British monarchs is like Millwall FC signing Lionel Messi. In matters of artistic taste, Charles was from another planet: sophisticated, informed, passionate, progressive. Under his sceptre, Britain was fast-forwarded so successfully through two great ages of art — the Renaissance and the baroque — that it ended up as the most sophisticated court in Europe. How did we thank him? By cutting off his head. 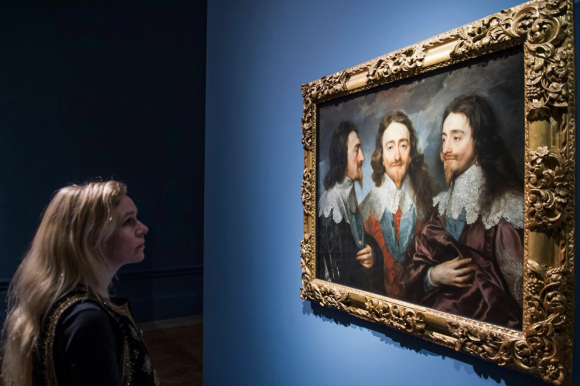 Some of this — the positive bits — is made clear by the superior exhibition devoted to Charles and his collection that has now arrived at the Royal Academy. Hand on heart, this is one of the best Old Master shows I have ever seen. From start to finish, the quality of the exhibits is remarkable. Each room brings a fresh batch of impressive pictures and a twitch on the tiller that sends the narrative in another telling direction. Charles was king from 1625 to 1649, a shortish reign by recent royal standards, but one that made the nation, and its art, unrecognisable. There are no examples here of the type of portraiture that preceded his arrival, but had there been, they would have shown a full-length Elizabethan mannequin staring stiffly ahead, while every detail of their jewel-encrusted costume was precisely depicted. Before Charles, clothes madeth the man and the woman. Compare that with the extraordinary triple portrait of the king by Van Dyck — Charles from three angles — that greets visitors to this event. Painted in 1635 for the greatest sculptor of the baroque age, Bernini in Rome, it was intended as a guide for a bust of Charles that Bernini was carving. Seeing the king from the front and the sides was a practical arrangement dictated by the commission. Yet Van Dyck somehow creates a sense of psychological flow between the three heads, as if a deep thought were being passed from one to the other, and to tug us into the king’s inner life. It’s a piece of baroque brilliance that zooms the show 100 years up the track from the Tudor age. So there’s immediate proof here that a new artistic moment has arrived. Surrounded by a circle of enlightened collectors, the art-loving Charles began assembling the finest selection of Old Masters ever to fetch up on these shores, and to match them with his enthusiastic support for the best modern masters working at the time. Van Dyck, who became court painter in 1632, is joined by his teacher Rubens, the most famous painter in Europe, whose fabulous self-portrait wearing a black hat was given to the king by Rubens himself. Charles hung it next to his bedchamber and would have passed it most days. 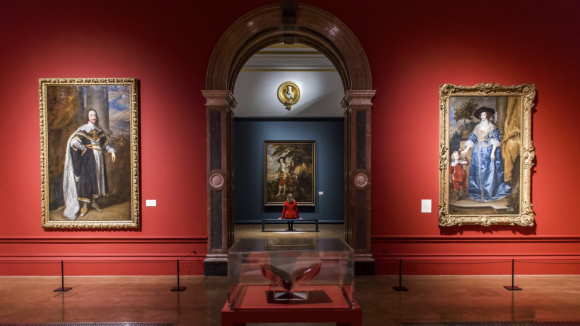 In the space of a few pictures, art in Britain has shot to the front of the European queue. While Charles the patron was especially supportive of Flemish art, Charles the collector, “a Titian obsessive”, was particularly enamoured of the Italian Renaissance. Reason number one why this show is such a spectacular success is that it has managed to bring together so many of the pictures that Charles acquired, and that Cromwell later sold off. The biggest purchase was the Mantua collection, bought from the Gonzaga dukes in 1628, represented here by a dazzling cast of returnees from the Louvre, the Prado and the Royal Collection. Chief among these are Mantegna’s Triumphs of Caesar, the nine huge canvases that usually hang in Hampton Court, where they are difficult to see, but which now command the central galleries at the Royal Academy, where they are so much easier to admire. Charles was pioneering as well in collecting the art of the northern Renaissance, as a room of Holbeins, Dürers and Gossaerts makes obvious. Surprisingly, where Holbein’s miraculously vivid portraits of the court of Henry VIII are concerned, it was Charles, not Hal, who acquired them for the Royal Collection. His fondness for Italian art, meanwhile, led to a mass of purchases that filled his palaces with Titians. What is shown here is impressive enough: Titian’s Supper at Emmaus from the Louvre, with its sombre dignity; or his beautiful Conjugal Allegory, in which Alfonso d’Avalos finds himself playing Mars in a mysterious tale of love. But then there are things that are not here — the gorgeous Venus with an Organist, in the Prado, or Caravaggio’s momentous Death of the Virgin, now in the Louvre, but once in Whitehall. Picture for picture, it was probably the most ambitious display of collecting the world has ever seen. If anything, the support Charles dished out to the best contemporary painters of his time was even more impressive. Collecting took pots of money. Patronage took vision, taste, courage — as well as pots of money. In the case of Van Dyck, it led to a royal portraiture that scaled epic new heights. One of the best features of this show is its clever switching of plotlines. It’s a process that reaches its apogee in the RA’s central hexagon, where Van Dyck’s two great equestrian portraits of the king, one from Buckingham Palace, the other from the National Gallery, loom up suddenly before us, bigger than life, king and horse riding out Sir Galahad-style to save the nation. Yet even here the genius of Van Dyck manages to smuggle hints of introspection and nervousness into Charles’s face. It was something he did in every royal portrait. However impossible it was for him to know that there was tragedy ahead, and that Charles would be executed by his own people, every portrait he painted of the king seems to be freighted with a sense of foreboding. It’s uncanny. And brilliant. As for the queen, he flatters her outrageously without ever appearing to flatter her outrageously. We know from the reports of visiting ambassadors that in life Henrietta Maria was tiny, and that her front teeth stuck out “like the guns on a ship”. But in Van Dyck’s hands, she becomes so delicate and beautiful. The pictures of the king and queen together, meanwhile, are such a convincing record of real love. Another useful thing the show does is to emphasise Henrietta Maria’s importance in Charles’s cultural awakening. French and Catholic, brought up in a sophisticated European court, she played a role in yanking British culture out of the half-timbered Tudor age that has been hugely undervalued. So this is a marvellous event — a collection of masterpieces that makes scores of important social and cultural observations. Yet it also has a big failing. For reasons known only to its curators, this superb tribute to Charles I manages somehow to overlook the end of his story. Not a word is uttered here of the Civil War, with its disastrous consequences for crown and country; nor of the brutal beheading of the king, caused, in some important part, by his lavish spending on art. 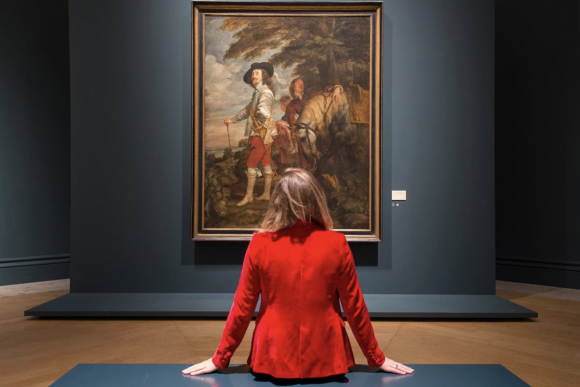 In the process of avoiding Charles’s demise, we lose sight as well of the great native painter William Dobson, whom the fates delivered on the scene to record the final days of the Royalists. How perverse that an event stocked so spectacularly with foreigners should miss out on a notable English presence. It’s an unaccountable omission. I can only assume it was caused by some misguided sense of royal propriety.